Commuters and motorists on Boko-Techiman road in the Atwima Kwanwoma district of the Ashanti region will soon be cut off from surrounding communities if the bridge that connects them is not saved from collapsing. The bridge which is half washed away by rains makes it difficult for two vehicles to pass one another at the same, a situation the residents have reported to the authorities to reconstruct but to no avail. 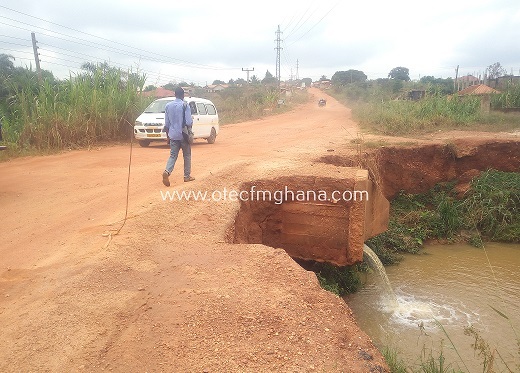 Otec News’ reporter, Emmanuel Asiamah, who visited the community, said a deep gully has been created by erosion on one side of the bridge, and if not given an immediate attention, it will eventually collapsed, as the raining season starts. Some drivers and residents who spoke to Otec News said the situation is alarming and can lead to possible accidents, especially to first time users during the night. Otec News also learnt that road networks at Boko community is poor; full of potholes, untarred and crooked, making them ‘unmotorable’. “Traveling on this road has become stressful due as the worn out bridge has become so narrow that you have take time to across it because it is not taken, you might fall into it” one sad driver said. 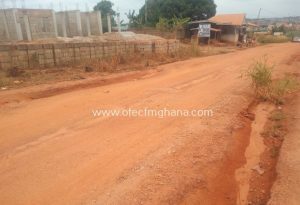 A resident of Boko also said “we spend several hours covering this road and sometimes have to walk to Techiman to catch up vehicles to continue our journeys. Just recently a salon car fell into the river in an attempt to give way to an incoming vehicle on the bridge. We are therefore appealing to the district assembly to come to our help”. “The bad nature of the road and the bridge are affecting our daily business activities, not to mention the dusts that emanate from the road making their living uncomfortable,” another resident added.